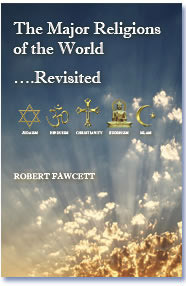 Mecca is the original English translation of the Arabic. Historically, the city has also been called Becca. In the 1980s, the Saudi Arabian government, and others, began promoting the spelling Makkah (in full form, Makkah al-Mukarramah), which more closely resembles the actual Arabic pronunciation. According to Islamic tradition, the history of Mecca goes back to Abraham when he built the Ka'aba with the help of his son Ishmael around 2000 BC. According to other Islamic tradition, Abraham was to have rebuilt the Bait-ul-Allah (House of Allah), a building which had been originally constructed by Adam. Today it is called the Ka'aba, a building in Mecca towards which all Muslims around the world face in prayer, five times each day. Muhammad was born in Mecca in 570, and thus Islam has been inextricably linked with Mecca ever since. 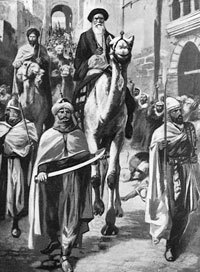 Muhammad was born in a minor faction, the Hashemites, of the ruling Quraysh tribe. Islamic tradition states that he began receiving divine revelations there in 610 AD, and began to preach monotheism against Meccan animism. Animism is the belief that all life is produced by spiritual forces separate from matter, and natural phenomena and objects (rocks, trees, the wind, etc.) are alive, and have souls. See section "Muhammad, Background & History. Mecca was cleansed of all its idols, and all the cult images, in the Ka'aba when Muhammad conquered Mecca in 630 AD. He therefore, ended the Quraysh's tradition of idol-worship by smashing the statue of Hubal along with the other 360 idols (perhaps, one for each day of the year) at the Ka'aba, and re-dedicated the structure to ALLAH, the one God. His triumphant return to Mecca is depicted in the picture to the right. Controversies have exploded over images depicting the Prophet Muhammad, namely his depiction as a turbaned terrorist in one of a dozen cartoons by Danish artists. Muslims explicitly prohibit images of God, Muhammad, and other prophets. Islam prohibits the representation of the human figure in art. But does the Qur'an actually ban representations of Muhammad, or others? The answer is no. There is not a single verse in the Qur'an that explicitly prohibits images of Muhammad-or of ALLAH, or God, for that matter, or any other human figure. In any event, up until that time, Mecca's most important god was the god Hubal (an idol god worshipped in Arabia), having been placed there by Muhammad's ruling Quraysh tribe. Historians state that the Ka'aba became the repository of these 360 idols and tribal gods from all of Arabia's nomadic tribes, and Hubal was the most senior of these 360 god idols worshipped in the shrine. Islamic history states that Zamzam Well was revealed to Hajar, the wife of Abraham and mother of Ishmael, around the year 2000 BC, when she was desperately seeking water for her infant son. See the section on Islamic history. The name of the well comes from the phrase Zomâ Zomâ, meaning "stop flowing," a command repeated by Hajar during her attempt to contain the spring water. 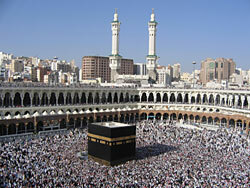 The Ka'aba is 40' cube style building made of granite, and rests on a marble base. Located in the city of Mecca, Saudi Arabia, it is the most sacred site in Islam. The building predates Islam, and, according to Islamic tradition, the first building at the site was built by Abraham. The building has a mosque built around it, the Masjid al-Haram. All Muslims around the world face the direction of the Ka'aba during prayers, no matter where they are. Islamic tradition narrates that Abraham's subsequent visits to the Arabian region, after leaving Ishmael and Hagar (in the area that would later become the Islamic holy city of Mecca), were not only to visit Ishmael, but also to construct the first house of worship for God, the Kaaba — as per God's command. With the traumatic event of Muhammad's death in 632, there was no succession plan for new leadership left by the Prophet. There were two schools of thought as to who should lead the community: one group adopted the belief that leadership should pass to the most qualified leader; another group adopted the belief that leadership should be through hereditary succession. These two groups have been at odds with each other ever since that time. See section on Islam denominations. And, this is the background as to how Islam is considered to be one of the "Abrahamic religions" with Judaism and Christianity because of the forefather role Abraham plays in their history, and in their holy books, as these religions evolved out of Abraham's life, and experience with God. Today, there are well in excess of 3 billion followers of these Abrahamic religions, accounting for more than half of the world's population. The Islam religion has some 1+ billion adherents, and is the 2nd largest religion behind Christianity which is double that size. The Hajj is a pilgrimage to Mecca (the Arabic name is Makkah). It is the largest annual pilgrimage in the world, and is the fifth pillar of Islam — an obligation that must be carried out at least once in their lifetime by every able-bodied Muslim who can afford to do so. The Umrah (meaning, "to visit a populated place") is a pilgrimage to Mecca performed by Muslims that can be undertaken at any time of the year. The Umrah is not compulsory, but highly recommended. A rite of these pilgrimages involves the story of Hagar's repeated attempts to find water for her son by running between the hills of Safa and Marwa. This has developed into a Muslim rite known as the sa'i. 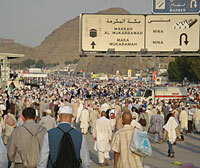 During the two Muslim pilgrimages, pilgrims are required to walk between the two hills seven times in memory of Hagar's quest for water. The rite symbolizes the celebration of motherhood in Islam, as well as leadership of the women. To complete the rite, Muslims drink from the well of Zamzam. Muslims will often take back some of the water, regarding it as sacred, in memory of Hagar.